Arizona quarterback Kevin Kolb was harrassed, hurried and hit often as the Rams defense dominated the Cardinals in a 17-3 win Thursday night at the Edward Jones Dome in St. Louis. The win snapped an eight losing streak against the Cardinals at home. Robert Quinn led the defense with three sacks and a forced fumble. Linebacker James Laurinaitis and defensive back Cortland Finnegan each had ten tackles and a sack as well. Kolb was hurried 32 times and lost his helmet twice on hits from the Rams defense. 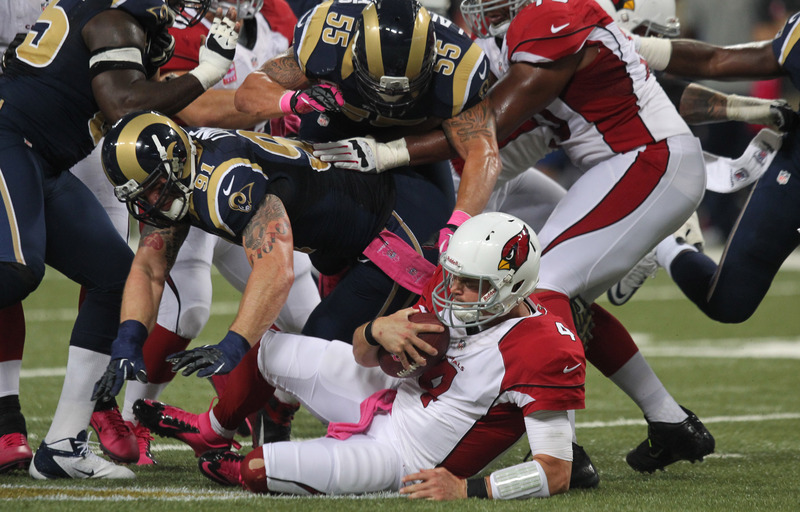 The Rams also limited the Cardinals to 45 yards rushing on 17 carries. The defense needed to come up big on a night when the offense sputtered. Sam Bradford hit Danny Amendola for a long gain on his first attempt of the night, but later went through a string of 12 straight passes without a completion. Holding onto a 14-3 led, Bradford found rookie Chris Givens open for a 52 yard touchdown after Givens put on a great double move to get open. Bradford finished 7 for 21 for 141 yards, the second-lowest total of his career. Bradford may have to rely on Givens and other even more after Amendola went down with what is feared to be a broken collarbone. Midway through the second quarter, after Amendola landed on his shoulder while diving for a pass. The Cardinals drop to 4-1 and the Rams improve to 3-2, almost a must win game that would have set the Rams back three games in the division. The Rams have a record above .500 for the first time since November 2006.